NEW: Analyst calls operative "one of the leading al Qaeda figures in East Africa"
(CNN) -- Somalia said a senior al Qaeda operative tied to several attacks in East Africa was killed Monday in a U.S. strike in southern Somalia. 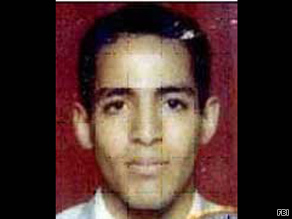 Saleh ali Saleh Nabhan, pictured on the FBI's Web site, reportedly was tied to al Qaeda's East Africa operations. Intelligence sources have confirmed to the Somali government that Saleh ali Saleh Nabhan was killed, Information Minister Dahir Mohamud Gelle said Tuesday. "We welcome that attack because those people targeted were murderers, and they are unwanted and unwelcome in Somalia," Gelle said. Nabhan's death will have "a major impact" on al Qaeda's operations in the Horn of Africa, according to one regional analyst. U.S. special operations forces used a helicopter to fire on a car Monday in southern Somalia, killing several people, including one they believed was Nabhan, U.S. officials told CNN earlier. Nabhan, 30, was born in Kenya and had been tied to attacks that included the 1998 bombings of the U.S. embassies in Kenya and Tanzania, according to the sources. More than 200 were killed, and 4,000 wounded in those attacks, most of them Kenyans. The United States targeted Nabhan in an airstrike in southern Somalia near the Kenyan border in March 2008, U.S. officials said at the time. In February 2006, the FBI announced that Nabhan was wanted for questioning in connection with the 2002 suicide bombing of an Israeli-owned hotel and the unsuccessful attack on an Israeli charter jet in Mombasa, Kenya. Ten Kenyans and three Israelis -- including two children -- were killed when three suicide bombers detonated a car bomb outside Mombasa's Paradise Hotel in November 2002. The bombing took place within minutes of an unsuccessful missile attack on an Israeli charter jet, which was taking off with 261 passengers and 10 crew members. President Obama signed off on Monday's operation, a senior U.S. official said. The United States had been monitoring the situation for days and had intelligence that Nabhan was in the area, the U.S. officials said. The officials who talked to CNN are familiar with the latest information on Monday's strike but did not want to be identified because they were not authorized to talk to the media. The U.S. helicopter flew from a U.S. Navy warship offshore, while the ship kept watch on the operation, one of the sources said. The warship was ready to rescue the American troops if they got into trouble. Farmers in the southeastern town of Barawe, Somalia, said they witnessed the assault. They said helicopters attacked a car and its occupants and that at least two people died. The witnesses said some helicopters landed and that some of the injured or dead were pulled into at least one helicopter. A U.S. official said the troops landed to take away the body believed to be that of Nabhan for positive identification. Nabhan is believed to be an associate of al Qaeda member Harun Fazul, who was indicted in the 1998 bombings of the U.S. embassies. The U.S. military has long sought Nabhan because he is believed to be deeply involved in al Qaeda's East African operations, a senior U.S. official said last year. "He was certainly one of the leading al Qaeda figures in East Africa," said Rashid Abdi, a Somalia analyst for the International Crisis Group, an independent advisory and analysis organization. Nabhan "has been living in the shadows" in Somalia and not much is known about his recent activity, Abdi said. "The fact that he is now out of the picture will have a bigger impact on al Qaeda than on Al-Shabaab," he said, referring to the Islamist militia in Somalia that has ties to al Qaeda. "He is a man with an important organizational memory, and if a key figure like him is killed, it always has a major impact." Al-Shabaab is waging a bloody battle against Somalia's transitional government and is on the U.S. list of terrorist organizations because of its al Qaeda ties. There are growing concerns that Somalia could be the next base for al Qaeda as U.S. forces pound their positions in Afghanistan and Pakistan. CIA Director Leon Panetta recently said the intelligence agency is keeping tabs on the region as a possible destination for fleeing al Qaeda operatives. Journalist Mohammed Amiin Adow and CNN's David McKenzie, Barbara Starr and Ed Henry contributed to this report.